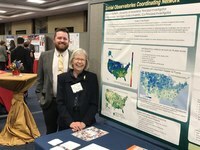 Prof. Sandra Hofferth, Faculty Associate and past-Director of MPRC, along with student Andrew Williams, presented information on the Social Observatories Coordinating Network project that she has been directing for the past five years. The presentation summarized the central findings of the project, which researched the potential benefits and challenges of a national network of social research observatories. The study concluded that behavior is so situation- and place-specific that it is practically impossible to use unclustered and widely dispersed national samples of populations to draw conclusions about processes in any one place. Prof. Meredith Kleykamp assisted with a presentation by her student Sidra Montgomery, whose dissertation project focuses on post-9/11 injured veterans and the differences between those visibly wounded and those whose injuries are harder to see. 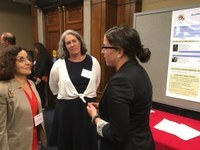 The Coalition for National Science Funding (CNSF) holds a yearly exhibition of exemplary science for the benefit of members of Congress. This 23rd annual exhibition took place in the Rayburn House Office Building on Capitol Hill. In addition to members and their staff, NSF Director Sandra Córdova reviewed the exhibit, seen here with Dr. Kleykamp and Ms. Montgomery. CNSF is an alliance of over 130 professional organizations, universities and businesses united by a concern for the future vitality of the national science, mathematics, and engineering enterprise. CNSF supports the goal of increasing the national investment in the National Science Foundation's research and education programs in response to the unprecedented scientific, technological and economic opportunities facing the United States.